Fellowship Previews: Britain’s Biggest Comic Celebrates 40 years! Britain’s Biggest Comic Celebrates 40 years! The legendary British weekly comic 2000 AD hits four decades of continuous publication – and today marks its 40th birthday! First published in February 1977, 2000 AD is a unique British success story – one of the most influential comic books of all time. Millions of youngsters have grown up on its diet of science-fiction action, punk-inspired irreverence, subversive comedy, ultra violence, and disturbingly prescient dark satire. To mark the occasion, today sees the wide release of a special 40th anniversary issue featuring all-star creators from the vast history of 2000 AD. Online tributes for the British institution are pouring in from celebrity fans such as Jonathan Ross, filmmaker Ben Wheatley, and comedian Graham Linehan, along with the thousands of readers whose childhoods from the ‘70s to the present were shaped by the ground-breaking storytelling of the comic. And the celebrations are set to continue with special events and signings running throughout this anniversary year. 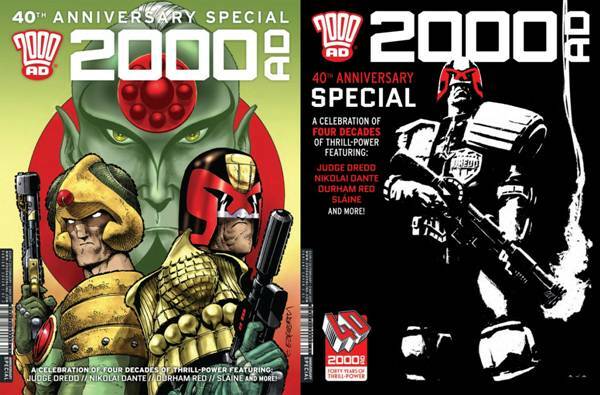 The UK’s biggest comics export, 2000 AD’s innovative and provocative series – such as Judge Dredd, Strontium Dog, Nemesis the Warlock, Halo Jones, and ABC Warriors – are now known around the world. 2000 AD has hit the headlines repeatedly over the past four decades and continues to do so to this day – from parodying the rich and powerful to battling censorship and using its characters to explore the social issues of the day in new and unusual ways. And generations have found its mix of extremes profoundly inspiring, from filmmakers such as Duncan Jones, Edgar Wright, Christopher Nolan, Joe Cornish, and Alex Garland to actors such as Simon Pegg and Karl Urban, from writers such as Neil Gaiman, Terry Pratchett, Alistair Reynolds, Lauren Beukes, and David Nicholls to comedians such as Charlie Higson, Phil Jupitus, and Charlie Brooker, and musicians such as Suggs from Madness, Robert Smith of The Cure, Geoff Barrow from Portishead, and Scott Ian of Anthrax. Still published every Wednesday, 2000 AD remains at the industry’s cutting edge and has, under current owners Rebellion, undergone a profound renaissance that promises to keep this British institution in rude health for another four decades.